TNT's epic drama Falling Skies – from Amblin Television and executive producer Steven Spielberg – will come to a climactic end this summer with the show's fifth and final season. Falling Skies tells the extraordinary story about life and survival in the wake of a catastrophic alien invasion. Noah Wyle stars as Tom Mason, a college professor who became an unlikely resistance leader. Moon Bloodgood is Dr. Anne Glass, a pediatrician who became the survivors’ primary physician and eventually fell in love with Tom. Will Patton is Colonel Weaver, the gruff and emotionally scarred commander leading the battle against the invaders. Also starring in Falling Skies are Drew Roy, Connor Jessup, Maxim Knight, Colin Cunningham, Sarah Carter, Mpho Koaho and Doug Jones. Since premiering as basic cable's #1 new series of 2011, Falling Skies has ranked as one of basic cable's Top 15 original dramas with total viewers and key adult demos. In its fourth season, the series averaged 4.7 million viewers, including 2.1 million adults 25-54 and 1.8 million adults 18-49. Across TNT's multiple platforms, the show reached an average of 8.4 million viewers per episode in its fourth season. Falling Skies is executive-produced by Steven Spielberg and Amblin Television heads Justin Falvey and Darryl Frank, along with David Eick. 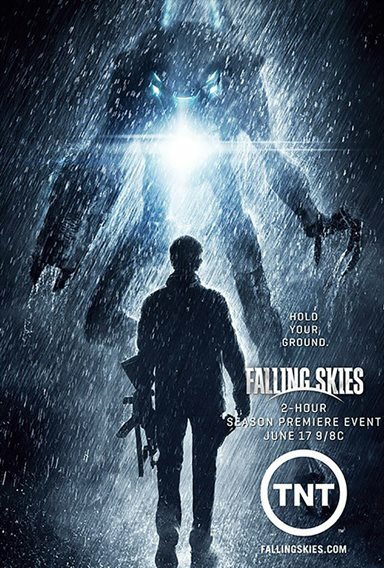 Download Falling Skies in Digital HD from the iTunes store. Falling Skies images are © Warner Bros.. All Rights Reserved.